You are here: Home / Ammonite / What’s on My Bench Today? What’s on My Bench Today? First of a new occasional series of posts looking at ‘What is on My Bench Today’? This is a snap shot of what I am actually working on at the moment. In the front you can see some tiny settings that I have soldered onto a piece of sheet. I have used 1.2mm silver because I want to make the stones appear taller than they are. They are 5 mm labradorite and moonstone cabochons. After soldering them to sheet, I drilled holes in the bottoms so they will be open and let the light in. Next I will cut and file around the outside before soldering them to a Ammonite Fossil Pendant. On the bench peg you can see one I finished yesterday, and behind you can see more of the enamels waiting for settings. On the right you can see my cup of green tea! Oops should this be on my bench? 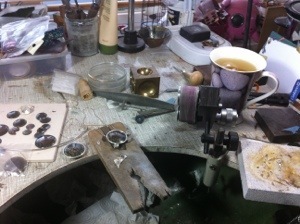 In front you can see another setting set up and about to be soldered. The tool clamped to my bench in front is my Wolf Tools Belt Sander that attaches to my Pendant motor in the background. That’s about it for now. The rest is just tools I have been using and haven’t put away. Hope you have found this interesting. I plan to make these posts informative so hope you find them interesting and useful. Let me know what you think.